Justice Wanjala, is a holder of a Bachelor of Laws (LL.B, Hons.) from the University of Nairobi, a Diploma in Law from the Kenya School of Law, a Master of Laws (LL.M) from Columbia University, New York and a Doctorate in Law (PhD) from the University of Ghent, Belgium. 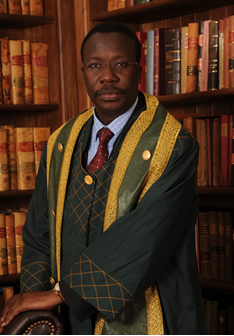 Before his appointment to the Supreme Court of Kenya, Justice Wanjala had been a Law Lecturer at the University of Nairobi for twenty (20) years (1986-2004) where he offered instruction in diverse areas of law including, Land Law, International Law, Human Rights Law, Criminal Law and Law of the Sea. He was appointed as Assistant Director of the defunct Kenya Anti-Corruption Commission (KACC), in October 2004 where he served in that capacity until 2009. While still lecturing at the University of Nairobi, he was appointed by President Kibaki to serve as the Joint Secretary to the Commission on Illegally and Irregularly acquired Public Land (the Ndung’u Commission) in 2003. He is credited with having overseen the compilation and writing of what has become popularly known as the Ndung’u Report. Justice Wanjala was the first Chairman of the Public Complaints Committee on the Environment (PCC), which is one of the Compliance Committees of the National Environment and Management Authority-NEMA. He has many publications to his credit including books and articles in the fields of Law, Human Rights and Governance. He has published locally and internationally. Apart from his accomplishments in academia as a Law Teacher and Author, Justice Wanjala has participated in major research projects leading to the compilation and production of seminal reports such as The Anatomy of Corruption in Kenya, the Governance, Justice, Law and Order for Kenya (GJLOS 2) and the Policy and Governance Framework for the Republic of Malawi. Justice Wanjala was actively involved in the struggle for Constitutional Reform in Kenya especially during his time in Civil Society in the 1990’s. He was one of the four founder members of the Centre for Law and Research International (CLARION) where they pioneered Civic Education in the country. He is a member of the International Commission of Jurists, ICJ-Kenya Chapter and the Kenya National Academy of Sciences. He has recently delivered lectures at the International Anti-Corruption Academy (IACA) during the Institution’s Summer Lecture Series.